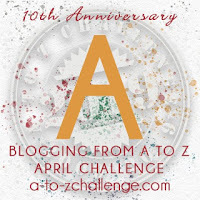 It's April - That means I will be participating in the A to Z Blog Challenge. 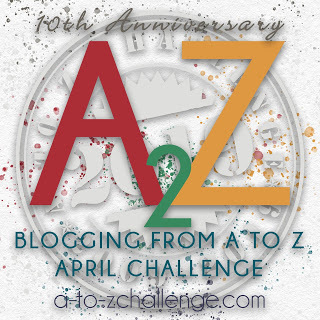 I will be posting six days a week for the month of April - (with a rest day on Sunday). 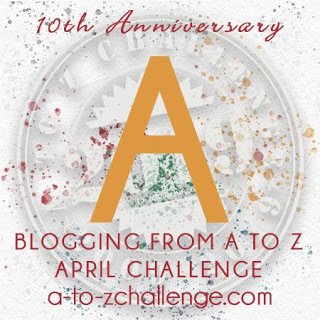 Each post will begin with the corresponding letter of the alphabet beginning with A and finishing with the letter Z.
I began participating in this challenge in 2012. With the exception of last year, I believe I completed the challenge each year. Last year I lost steam somewhere around the letter W.
Addy was not feeling well. Her head was hurting. She was still in bed and had been awake for several hours. Holding her head, with a palm pressed on each side of her temples, she admonished herself. "It's your own fault!" Her mother's words echoed in her throbbing head, "Adelaide, when will you learn?" 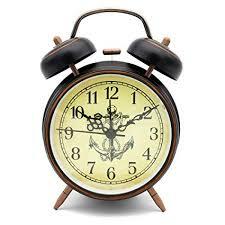 She painfully turned and looked at the old fashioned clock on the bedside table. The clock was one of her treasures. It used to sit on the dresser in her grandmother's bedroom. She groggily thought about the rainy days she once spent in the big stuffed chair in Nana's room, reading and listening to the tick, tick, ticking of that clock. Now, squinting through bleary eyes, she could barely make out the numbers. She reached over, picked up the clock and brought it closer to her. "Ohh," she groaned. It was 6:59. Sixty seconds before the alarm would sound its loud vibrating ring. She felt around the back of the clock to find the off switch. Aspirin. She needed aspirin and water. Aspirin, water, and a shower. She promised herself that she would get up in a minute or maybe two. For the last two months Addy had not been herself. Or, as her mother was only too happy to point out, she was too much like herself lately. Well, her old self that is. Addy ran her fingers through her unruly thick curly red hair. She moaned. Even her hair hurt. "You have to get it together, Addy," her boss said to her. It was a warning about the number of days she had recently called out sick. She had missed 6 days alone last month. During moments of clarity, of which there were few recently, Addy knew that her behavior was destructive on more than one level. She tried to justify it, though. It was too hard to be present when her life line had deserted her. Smiling ruefully, she obviously knew it wasn't desertion. Propped on her elbows, she pushed herself up and swung her legs over the side of the bed. After resting there for a minute or perhaps two, she hoisted herself up, slipped her bare feet into slippers and warily made her way to the bathroom. She remembered how proud Nanna was that long ago day Addy showed her the certificate of excellence she had received. It had her name written in fancy letters with a raised golden stamped seal. Nanna smiled and with that always present twinkle in her eye, she said, "Adelaide, I knew you could make a whole year of school without being absent one day." I've been where Adelaide is more often than I care to remember. Great start! Sometimes it just is hard to get that perfect attendance. Is it a drinking problem she's dealing with? That's the sense I got from the piece, but I may be misinterpreting. Well let's just say she is self medicating to ease pain.